In any site in your account, you can create Pre Messages, which are sent automatically to visitors based on certain conditions, for example when they are viewing a particular page in your site. To get started, head to your Settings tab in the Admin Console, then Pre-messages on the left hand side. Initially, you can choose a site, type an internal message name for identification purposes, then enter your message content. Messages can include emoji and other text variables that might be available. Next choose the option to either show member details to display the avatar and name of a random online agent, or not display any member details. Next, you can insert up to 2 buttons in your message, which can be defined with links to other pages on your site, or if no links are provided, they will be used as prompts to start a new chat. 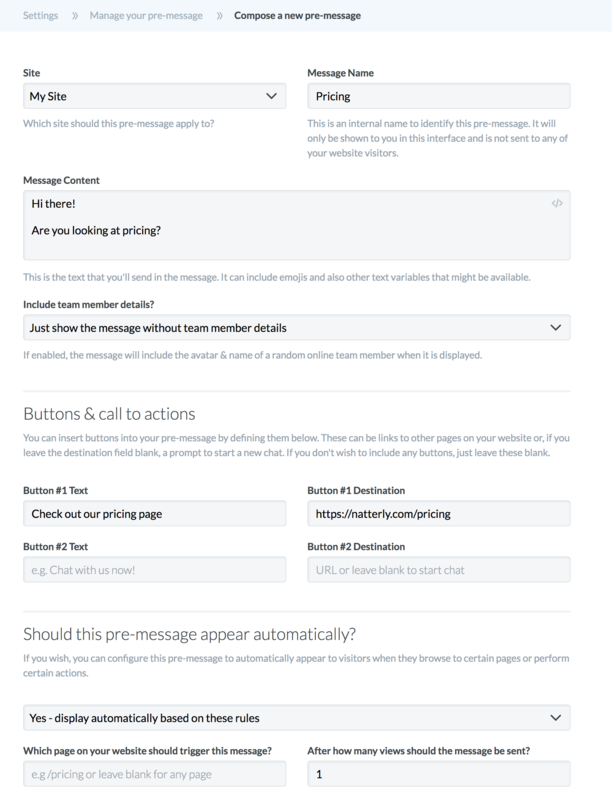 Finally, you can choose automation rules for your pre-messages, including a specific page on your website to trigger the message, and a number of views from the user that should occur before the message is sent.